Heartworms are probably the most well-known of canine parasites among dog owners, maybe second only to tapeworms. Cat owners should probably also be aware of them, as well, since heartworm infections are less common in cats but often more deadly. Adult heartworms can be up to a foot in length, though the male worms are smaller by about a third. They reside preferentially in the pulmonary arterial system (the arteries that carry deoxygenated blood to the lungs) and heart. Untreated, heartworms damage the tissues and blood vessels of the lungs and eventually lead to death from congestive heart failure. Like many parasites, heartworms have more than one host. Their primary hosts are canids (domestic dogs, coyotes, wolves), and they require a secondary or intermediate host (mosquitos) to mature to adulthood. Juvenile heartworms are called microfilaria and circulate in the blood of an infected host animal (usually a dog). 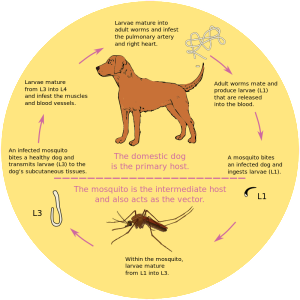 When a mosquito bites an infected dog, she draws the microfilaria into her body. The microfilaria cannot mature to adult heartworms without first maturing to their next larval stage inside a mosquito. 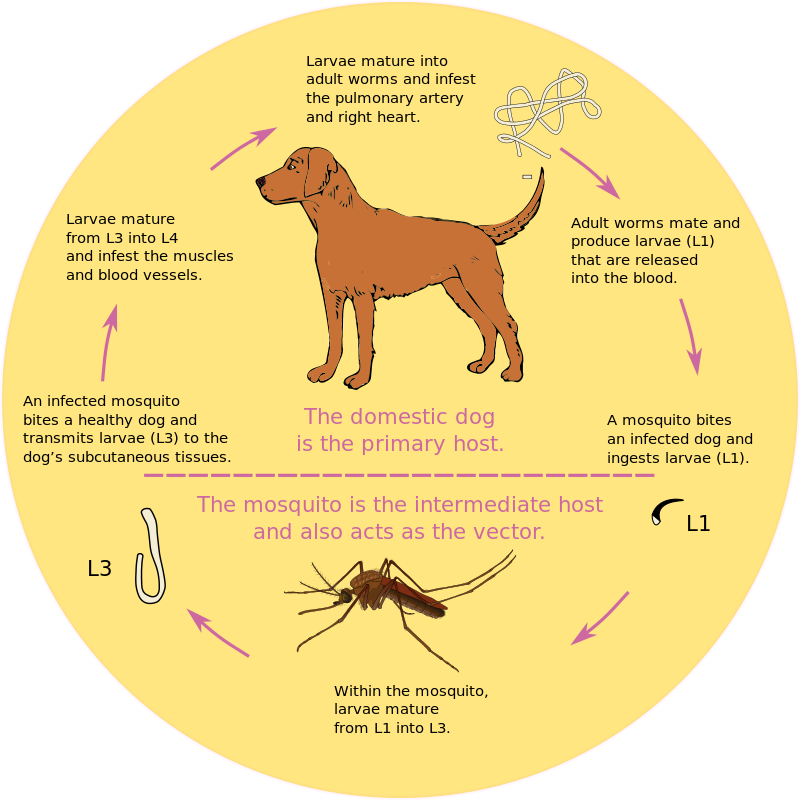 When the mosquito then bites another dog, the mosquito larvae leave the mosquito’s mouthparts and enter the skin under the bite location. Over a period of weeks the larvae mature to their next stage, when they migrate to the muscles of the chest and abdomen. In some cases they might not reach their intended destination, and may end up in a dog’s legs, eyes, or brain which can cause limping, blindness or neurological problems. The larvae then molt a final time and migrate to the pulmonary artery, where they begin to mate and release microfilaria of their own. Total time from being bitten by an infected mosquito to infection by mature heartworms is typically 5 – 8 months, depending on the ambient temperature, and antigen tests cannot detect an infection until there is a gravid (pregnant) female present. This is why we require a negative heartworm test every year to prescribe heartworm preventative… the period of time from exposure to detectable infection is so great that there are a lot of opportunities for a missed dose to result in an infection. Heartworms are endemic in North Texas, and it is imperative that our dogs in North Texas take heartworm preventative year-round. We regularly have winter temperatures that allow mosquitos to mature. Animal Hospital Southwest offers in-house blood parasite screens that can identify heartworm infections (as well as some other common blood borne parasites), and a range of heartworm preventatives from once-monthly topical medications to a six-month preventative shot.